The category five cyclone Winston made landfall of Fiji's main island, Viti Levu, late on Saturday night hitting the country with winds as high as 325km/h. The country had spent much of Saturday in lockdown, with transport cancelled and nationwide curfew and state of emergency declared by the government. Already there are initial reports of severe damage across the country, with reports of houses being flattened and heavy swells washing away sea walls. Unconfirmed reports suggest one person died when they were struck by falling debris on Koro island, according to local media, but a police spokesperson was unable to confirm reports. 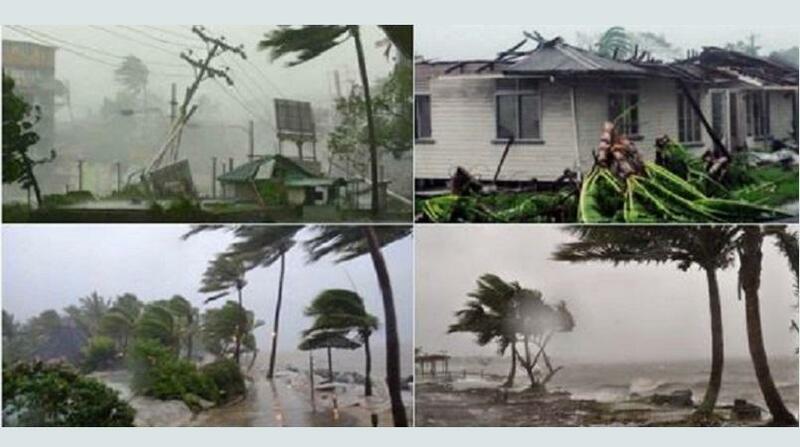 The Fiji Meteorological Service said the cyclone made landfall near Rakiraki, a district of close to 30,000 people on the northern coast of the main island, Viti Levu. Winston has average winds of 230 km/h, gusting as high as 325 km/h, and was forecast to track west along the northern coast at about 25km/h overnight. The Meteorological Service director, Ravind Kumar, said the cyclone would come within 20km of Nadi, near the country's main international airport and tourist areas, at about 6am on Sunday. "The scenario is not good," said Mr Kumar in a phone interview. "It is a category five system, it is very compact, and it has got very destructive hurricane force winds." Over the island of Vanuabalavu we recorded winds gusting to 145 knots (268km/h), so you can imagine the destruction that it may leave behind," he said. Winston began struck Viti Levu after passing across Fiji's eastern Lau group of islands. Authorities said contact with the scattered group had been lost and it was unclear what the extent of the damage there was. Winston was bearing down on a country that had spend much of Saturday in lockdown, and many days before that bracing itself for impact. Fiji went into a curfew at 6 o'clock on Saturday evening, with only essential services permitted to travel, and the government also declared a 30-day nationwide state of emergency in anticipation of widespread destruction by what was predicted to be one of the most destructive cyclones to ever hit the country of close to one million people. "As a nation, we are facing an ordeal of the most grievous kind," said the prime minister, Frank Bainimarama, in a statement urging people to heed authorities' warnings. "Some people in urban areas of the country in particular do not appear to have heeded the warnings about the seriousness of the threat we all face," he said. More than 700 evacuation centres had been activated throughout Fiji, and disaster authorities urged people in low-lying and exposed areas to evacuate before the cyclone set in. Public transport and flights were cancelled, and the Fiji Roads Authority urged people to avoid driving on the roads unless absolutely necessary. Many markets and businesses were ordered to close by the government, and people in the northern towns of Labasa and Savusavu were called on to evacuate. A resident in Savusavu, on Vanua Levu, Sharon Wild, said the cyclone was starting to strike the island with incredible ferocity. Ms Wild said the strongest she had ever experienced, and her family had taken to sheltering in the bathroom. "It's crazy outside, you can't imagine," she said in a phone interview, her voice trembling. "The coconut trees are swaying right over, I can't even see the island outside. I have no idea how my house is - if I still have a roof on my house. We have the sliding glass doors that are just shaking and they look like they're going to explode, so actually we're all sitting in the bathroom - we're all in the bath." However, both the government and aid agencies said Fiji was prepared for the arrival of cyclone Winston, and had stockpiles of relief supplies. Alice Clements, a spokesperson for Unicef in Fiji, said authorities and agencies had been preparing for Winston's arrival for days. "The government's been taking it very seriously and it's been doing a great job of reaching out to communities, making sure everyone's aware of where the evacuation centres are, providing constant updates through the weather service and through television, radio and online announcements," Ms Clements said. "We have suppplies that are prepositioned here in Fiji ready to go if requested by the government." The full ferocity of the strongest cyclone ever recorded in the South Pacific was expected to set in as darkness fell on Fiji, and what scene would emerge on Sunday was unclear. "Tropical cyclone Winston has begun its assault on Fiji," said Mr Bainimarama. "Let us all pray for our nation, ourselves and each other."